So far this year, job growth has been steady as the economy has continued to slowly chug along. This morning’s Job Openings and Labor Turnover Survey (JOLTS) report supports that story and rounds out our knowledge of the employment situation for June. In June, the number of unemployed fell to 8.3 million. While this is an improvement, the number of job openings also fell, which caused the job-seekers-to-job-openings ratio to stay put at 1.6-to-1. This ratio has been declining steadily from its high of 6.8-to-1 in July 2009, but it has been stuck at 1.6 for the past three months, as shown in the figure below. 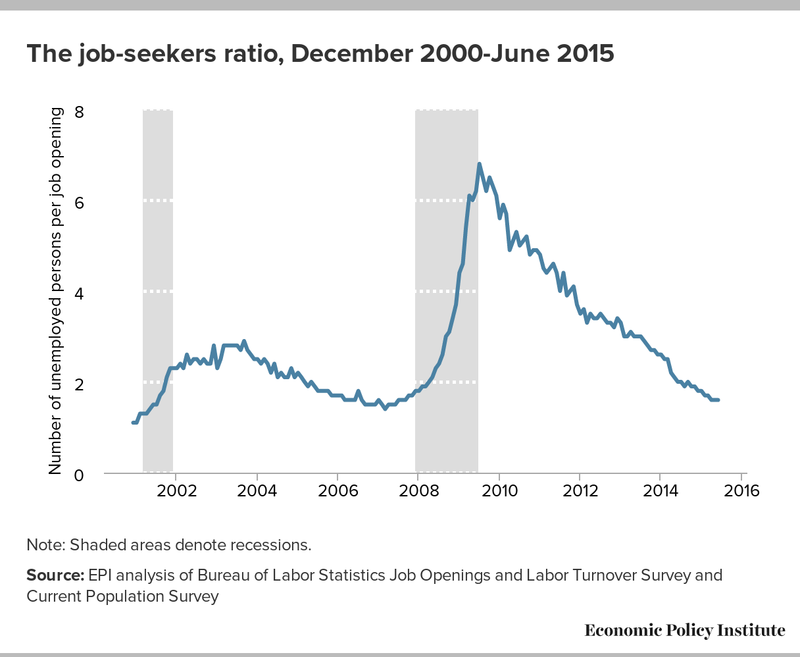 The job-seekers ratio is currently much higher than its low-point of 1.1 in 2000, indicating that there is still a lot of slack in the labor market. In a tighter labor market, this ratio would be closer to 1-to-1 or less, as there would be more job opportunities available for each job seeker. One piece of good news in June’s JOLTs report was the hires rate, which ticked back up to 3.7 percent, where it was at the end of 2014 before languishing at 3.6 percent for the first half of 2015. Though this improvement is a welcome sign, the hires rate still remains below its pre-recession level. In order to see a full recovery in the labor market, we need hiring to accelerate. 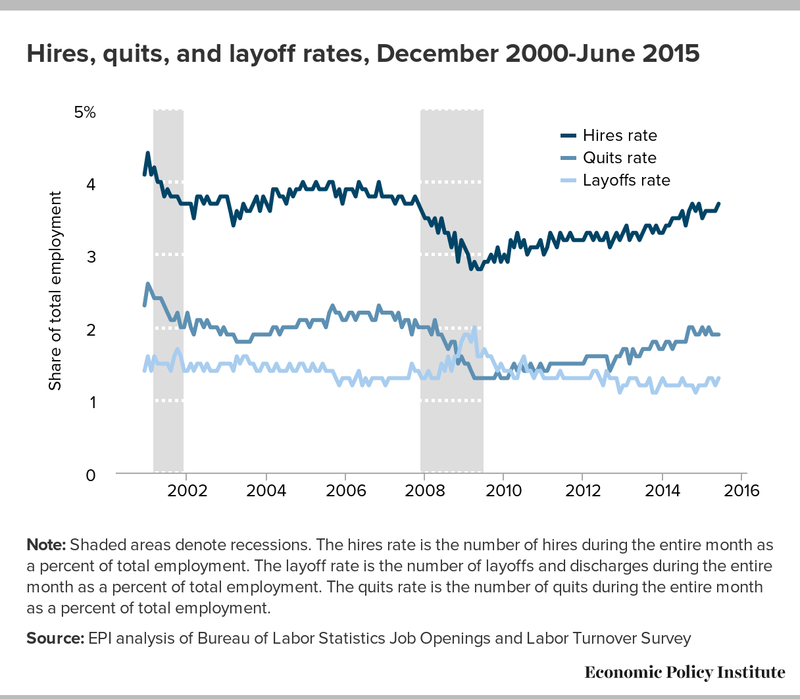 The figure below shows the hires rate in trend, as well as the quits rate and the layoff rate. Layoffs shot up during the recession but recovered quickly and have been at pre-recession levels for more than three years. The quits rate, on the other hand, remains depressed and has been stuck at 1.9 percent for three months now, which is an indicator of the labor market’s continued weakness. In June, the quits rate was still 9.2 percent lower than it was in 2007. A larger number of people voluntarily quitting their jobs indicates a strong labor market, one in which workers are able to leave jobs that are not right for them and find new ones. Before long, we should look for a return to pre-recession levels of voluntary quits, which would mean that fewer workers are locked into jobs they would otherwise leave if there were stronger job prospects.